It’s been 40 years since Columbia Sportswear made the rugged outerwear used in “Star Wars: The Empire Strikes Back,” but this week, it’s resurrecting the famous parka. The limited edition collectible, which looks just like those worn in the movie, has been updated with better technical fabric and construction, and is available online and in a handful of stores. Most are priced $500, but actor Mark Hamill, whose Luke Skywalker character wore the gear as he charged across the Norwegian tundra back in the day, signed 30 jackets. Those cost $1,980, the year the film was released, with all of the proceeds going to scholarships and educational charities. “Star Wars” geeks will recognize the details on the bright blue jackets, like shoulder stripes, a fiery Darth Vader patch, “Star Wars” logos and pocket nameplates. 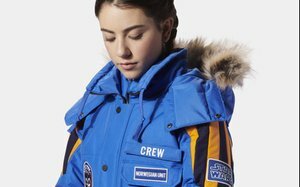 Columbia says its designers collaborated with Lucasfilm Ltd., and that the jacket’s linings include coordinates of the Hardangerjøkulen Glacier, where the scenes were filmed. Those kind of cold temperatures continue to be Columbia’s best friend. The 80-year-old company recently reported its strongest quarterly and year-to-date results ever, fueled by strong demand for rugged outerwear. The Portland, Ore.-based company posted a 6% sales increase for the third quarter to a record $795.8 million, increased its forecast for the full year, and offered a rare peek at its prediction for next year. Not only has the weather been in its favor, but orders for next spring are strong and the company is getting a favorable response to its lineup for next fall, writes Christopher Svezia, an analyst who follows the company for Wedbush Securities, which ranks the company as likely to outperform.